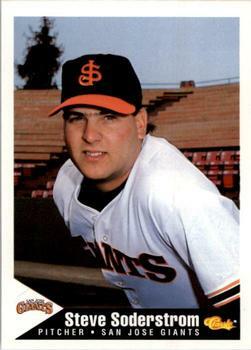 1994 San Jose Giants Cap - Fresh Fitted Friday!!!! Ok now, I know these entries are named "Fresh Fitted Friday" but sometimes it's important not to overlook the virtue of the non-fitted cap. While I am not suggesting the likelihood of entry titles like "Sweet Snapback Saturday" or anything of the sort, I do feel that certain cap logos just seem to look better on snapbacks. When I moved to New York City in 2010, I noticed then that much of the city's cap culture had started paying attention to snapbacks. I tried to stay away from that trend as much as possible but some caps represent your favorite team so well that, when they come your way it's hard to turn them down. Such was the case when I came across this vintage San Jose Giants cap. 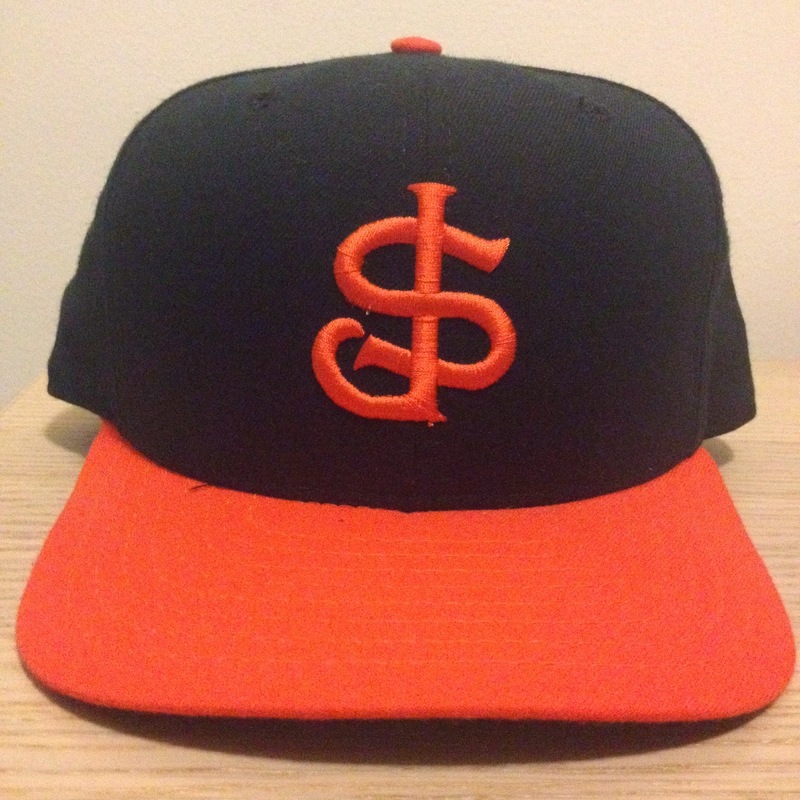 I've found that I'm not the only San Francisco Giants fan in town as I see plenty of standard SF Giants caps out and about, so I am looking forward to wearing this San Jose Giants snapback. I especially like the way the orange visor sets off with the green underbrim. It looks a little Sanitation Worker chic, but I'll take it. The only other time that I wear a snapback is when I catch games at CitiField and my headpiece of choice is usually this 1990's Tidewater Tides cap. In taking another look at that Tides cap, I noticed that the inside tags are identical on both caps. Again, I don't have too many snapbacks that I can reference to explain these variances but maybe that's a good enough reason to pick up a few choice ones here and there! Update: After thinking this through a little bit more and finding some photographic proof to back it up, I've decided this cap is from 1994. This cap features the MILB "batterman" logo band and while the MLB variation made it's debut in 1992, the MILB caps couldn't have been too far behind. Seeing that the under brim is green now the challenge would be to figure out what years the SJ Giants wore this cap. 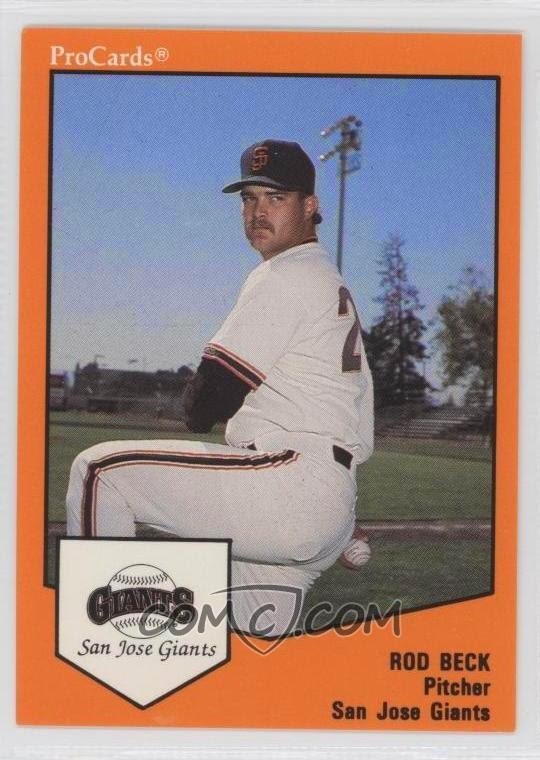 The fact that I can't find any instances of any orange-billed caps before this Steve Soderstrom card from 1994 really makes me raise an eyebrow.